Two years ago, The Document Foundation announced the MUFFIN concept, that is supposed to give users the freedom to change the user interface to what they are familiar with, and to adopt to any usage scenarios. Now, with the upcoming LibreOffice 6.2 release, we finally made this feature available for everyone, not only the brave users who enable experimental features. Meanwhile, the Groupedbar design follows the mantra “Simple by default, powerful when needed” with the basic principle to access “first-level” functions with one click, and second-level functions with a maximum of two clicks. What has the design community been working on in preparation for this release? Plus, the icons are now shipped as SVG vector graphics. If the rendering is stable and accurate we plan to switch completely in one of the upcoming releases. Read more on the technical background on this blog. Another great step ahead has been made regarding the personalization feature (Tools > Options) that took ages in the past to show results. Now it brings up the Firefox personas within a second or two. Read more about this here. We will continue the work on the Notebookbar variants. Some concepts are almost ready for publication. Ideally, users load the Notebookbar variants as an extension. And we are aware that a lot of work has to be done in this regards. Everybody is welcome to join the design group. Most of us are active on Telegram and you can just lurk around there and listen. But your input on tickets on Bugzilla with keyword needsUXEval is also very welcome. We pick some of those topics and discuss it in the weekly meeting, biweekly either on Wednesday evening (7pm UTC) or Thursday afternoon (1pm UTC). All information about who we are, how we work, and how to get in contact are provided on the LibreOffice wiki. I move to and from Word Perfect, Lotus spreadsheets and Libre. I wish you had a quick translations, especially to and from WP. It is a much more usable set of non-mainstream functions. Looking forward to this very much indeed – have been a grateful daily Libre Office user for more than 10 years. 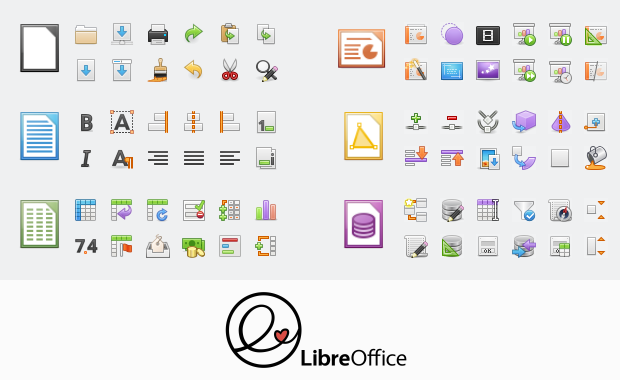 While I welcome any advancement in LibreOffice’s UI, I gotta say those new icons are pretty mediocre. Apart from stylistically looking like a relic from the 90s, the big problem is they’re so visually overwhelming. Compare the icons there to the ones in Google Docs or the latest release of Microsoft Word. 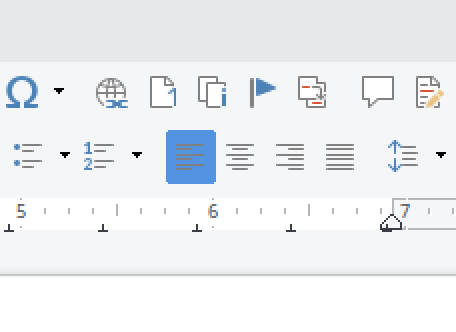 In GDocs and Word, the icons are intentionally rendered quite simplistically so you can quickly identify what they do. These new icons are the opposite – there’s so much going on that it’s impossible to easily determine what they do, and when using the software, it makes it hard to find what you’re looking for quickly. Give the Sifr icon set a try. It’s my preferred icon set and I think it will be what you’re looking for. Look what you have… the Right Justify button is on *left* (of Center), and the Left Justify button is on the *right* of Center. Again, this is exactly opposite of the layout in 6.1. I’d really like to see this get corrected before release. Can y’all do something about the launch times and resource usage? Compared to Microsoft Word, LibreOffice Writer launches a little bit slower and uses up 40 MB more RAM. I’d also like to see a new icon set (official or unofficial) based on the new Microsoft Office 2019/365 icons. Hello, the memory usage under Microsoft Office seems to be lower, but that’s also because parts of that suite are hidden within the OS, and preloaded when you start Windows ; which can’t be for Libreoffice since LO works also under OSX or Linux. I really like the Muffin interface since 6.1.2.4 and it’s exciting to test 6.2 right now. The new icons above are very gorgeous, I like them. 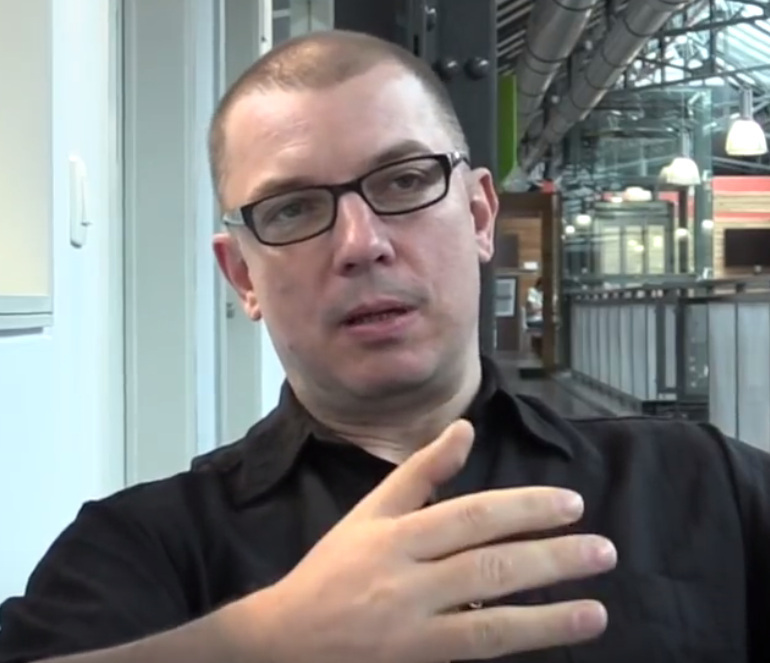 Thank you Heiko, thank you Mike, thank you all LibreOffice developers. It is beautiful.